The vibrant flavors of lemongrass, garlic, and ginger infuse this juicy Vietnamese fried chicken prepared with a wet batter for a delicate, light and crisp exterior! One of my husband’s and my favorite ways to spend a Saturday evening is to have a special little “date night” in, complete with some scrumptious food to share and a refreshing cocktail on the side to brighten the spirits. For us, nothing is more comfortable and enjoyable than being in our “cozy clothes”, and in our own dining room with our little tea candles lit, enjoying a good meal and good conversation together in a leisurely, relaxing way. A few weeks back, there was a drink my husband wanted to introduce us to called the “Penicillin”; it’s made with honey and ginger simple syrup, lemon, and a smoky Scotch (his drinks are the best I’ve ever tasted!). So I decided to get creative and put together a little finger-food type of meal that would pair in a tasty way with those flavors. Both of us had been craving some fried chicken for a while, and I’d been wanting to try out a new method of preparing it using a wet batter. So I took the opportunity to give traditional fried chicken a little bit of an Asian twist by way of the marinade; and let me tell you, it couldn’t have turned out any more amazingly delicious than it did! Vietnamese cuisine uses some wonderfully aromatic ingredients that impart a lot of flavor into food—this makes them perfect for use in a marinade for fried chicken, giving it a more intense, juicy and delicious flavor. 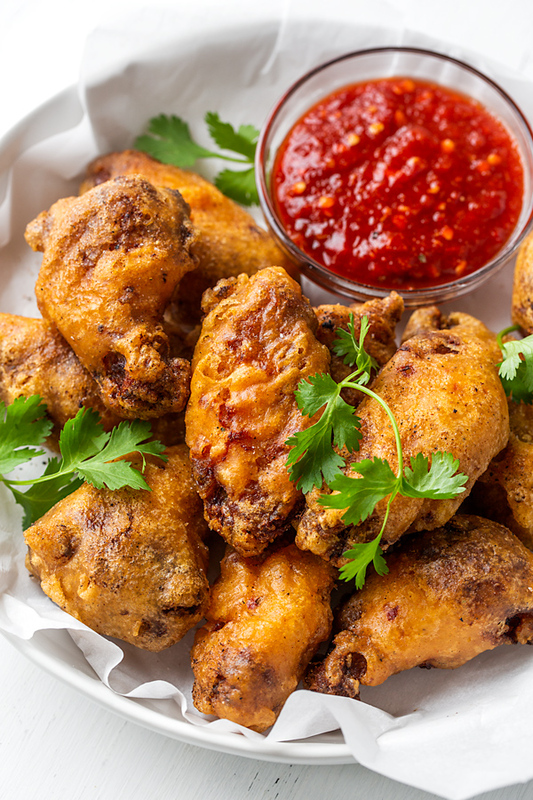 For this recipe, I chose to use drumettes and wings for ease. And for the marinade, I used lemongrass, garlic, ginger, lime, a whisper of fish sauce and a hint of brown sugar, along with some sambal (chili sauce) for extra heat. But rather than doing the traditional dry flour dredge, I prepared a wet batter which uses equal parts flour and cornstarch, a touch of baking powder, a little bit of extra seasoning such as salt, pepper, white pepper and cayenne (we like our stuff spicy), and some water—that’s it! The wet batter has the consistency of pancake batter, and clings lightly to the chicken as it gets dipped into the hot oil for frying. What comes out is golden, light, crispy, delicate, and scrumptious! 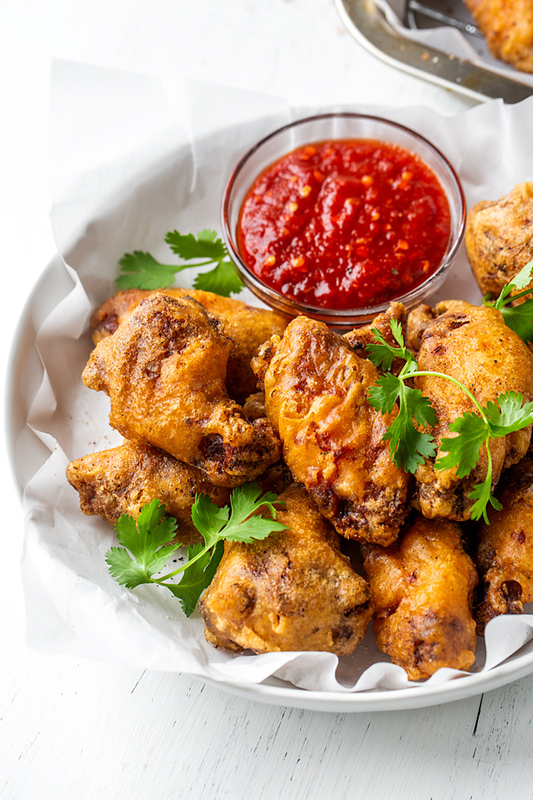 This Vietnamese fried chicken has now become our new favorite fried chicken recipe because of its exceptional flavor and juiciness and its more delicately crisp exterior. It’s delicious on its own, or served with some extra chili sauce on the side for dipping! Wet batter is very simple to prepare, and only requires a few ingredients, a bowl, and a whisk. Add flour, cornstarch, baking powder and any other seasonings that’ll make the batter flavorful to a large bowl for mixing. Add water and whisk to combine until the batter is smooth, and has a pancake-like consistency. Add the chicken into the batter in 2-3 batches, allowing any excess to drip off each piece before dipping it into the hot frying oil. Marination is key: The longer you can marinate this chicken the better! I go overnight with mine, and it yields incredibly juicy and flavorful meat. I recommend marinating at least 1-2 hours for good flavor. Add more spice, or leave it out altogether: Since we like our food on the spicier side, we add a generous amount of sambal to the marinade; but feel free to leave it out altogether for milder flavor. Get the oil nice and hot: This is a great opportunity to use a clip-on thermometer, as you need to get the frying oil nice and hot (365°) before you start frying. If the oil isn’t hot enough, the chicken will take on more oil and become greasy; if it’s too hot, it may burn quickly. Finish in the oven: I like to get my fried chicken extra golden, crispy and done, so after I fry, I place it on a wire rack and into a 350° oven for about 10 minutes, or to perfection! Serve “au natural”, or with chili sauce: This Vietnamese fried chicken truly needs no sauce, as it’s quite flavorful enough served “au natural”. But sambal (which you can readily find in the Asian section of most markets these days) is a great dipping sauce to serve alongside. 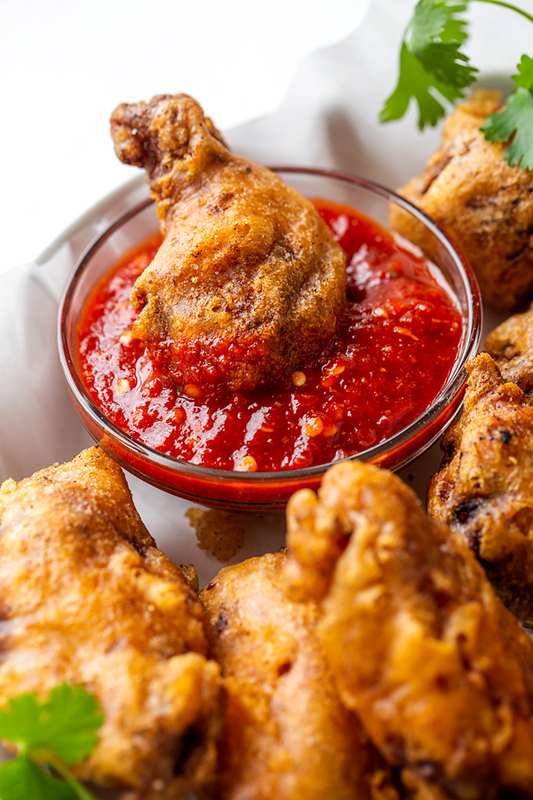 Lemongrass, garlic, and ginger infuse this juicy and delicious Vietnamese fried chicken prepared with a wet batter for a light and crisp exterior! –In a small bowl, whisk together the fish sauce with the remaining ingredients up to and including the grated ginger until well combined; place the chicken pieces into a large ziplock bag, and pour the marinade mixture over top, squishing things around to incorporate, and zip closed; marinate for at least 2 hours, or overnight. –When you’re ready to fry the chicken, fill a medium-size pot or cast-iron skillet with about 3-4 cups of oil (enough to submerge the chicken in), and slowly begin heating it until it reaches 365°. 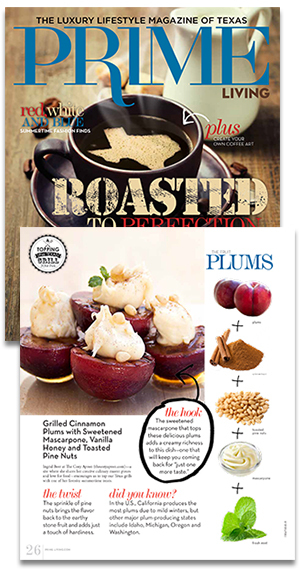 –Preheat your oven to 350°, and line a baking sheet with foil and a wire rack, if you have one. –Drain the chicken from the marinade, allowing any excess to drip off. –Make your batter by whisking together the flour with the remaining ingredients up to and including the white pepper, then add in the cold water; whisk the batter until it is completely smooth, and has the consistency similar to a pancake batter. 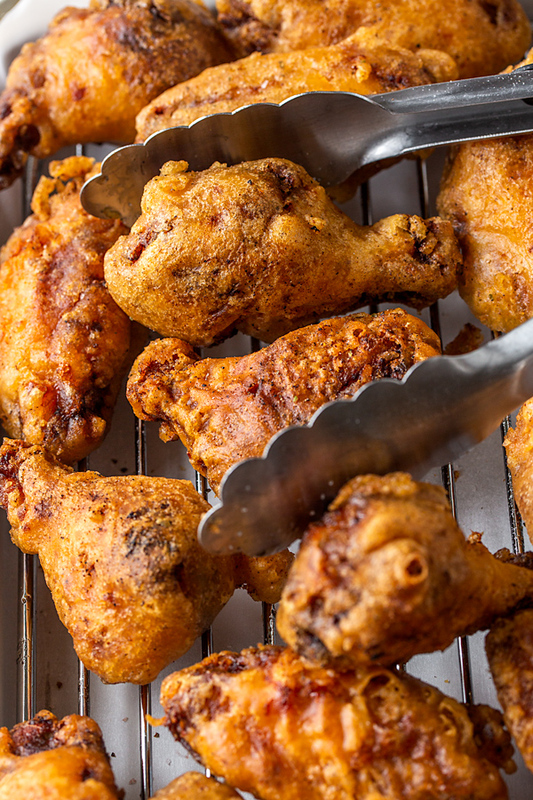 –Once your oil is at temp, add about half or a third of your chicken pieces into the batter, allowing each piece to drip off any excess batter before adding the chicken to the hot oil; fry the chicken for about 10 minutes, or until a deep golden-brown, then lift out of the oil and place onto the wire rack over the baking sheet to hold; repeat with the rest of the chicken. –Once all the chicken is fried, place the baking sheet with the fried chicken into the oven to give it a finishing “crisping up”, for about 10 minutes. –Place onto a platter, garnish with cilantro, and serve with chili garlic sauce to dip, if desired! Craving more chicken recipes? 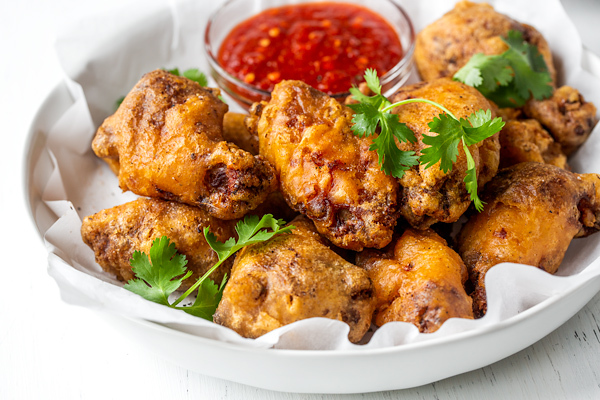 Check out this classic Fried Chicken recipe, these Baked Chicken Wings Tandoori Style, these Coca-Cola Hot Wings, Korean BBQ Style, or these Spicy Orange Chicken Wings!